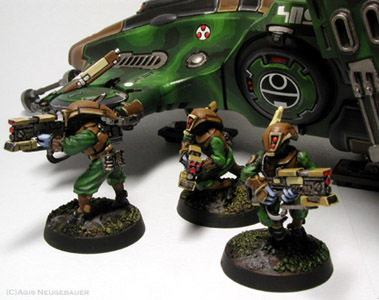 Ever since I heard of this new 40K race, I was very interested. 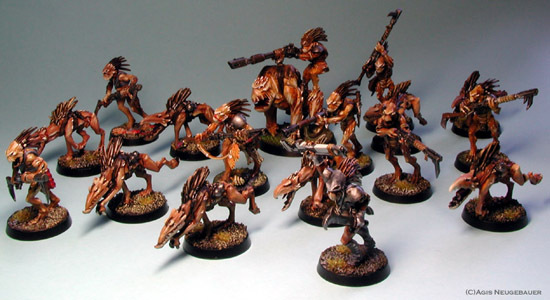 Some fresh blood for the dark and brooding 40K universe. At last a ray of light and hope in this world of gothic horror. 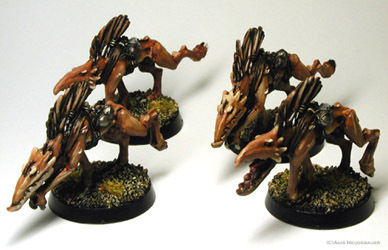 This conversion is also an older project. The existing Pathfinder range is not offering a lot of variety, so tine for a conversion. I think of this guy as a Shas’ui who is equipped with some highly classified new Drone concept, the Spotter drone! He still carries a Carbine, but the advanced Markerlight is actually the drone. Head swap, different backpack, Crisis weapon... The Drone is a Stand in for a Rail Rifle Pathfinder. The nice Cactus on the base is from Conquest Miniatures. 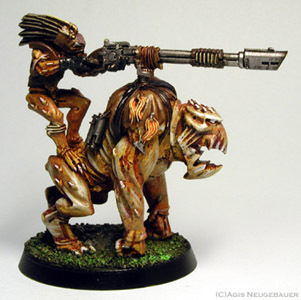 This conversion is for a Kroot Pathfinder that is accompanying the Veteran Pathfinders. This slight conversion is an old idea which finally is realised. The TL Crisis Weapons look of the “out of the box” suit were always not really my taste. So time for some shoulder mounted system. 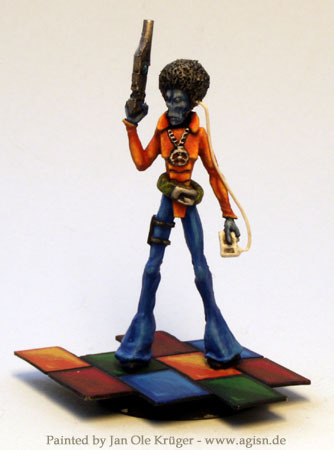 And again: The nice Cactus on the base is from Conquest Miniatures. My army box deal arrived and I immideately started to build some Crisis Suits. Boy they are fun to build! Good thing is that every possible weapon and wargear comes with the kit. First mini to paint was my army commander: Shas’O Sa’Shea Shovah Shi (translated: Commander Farsighted Victory from the world Sha’Shea). I equipped him with a plasma gun, missile pod, shield system and hardwired target lock, multitracker and drone controller. 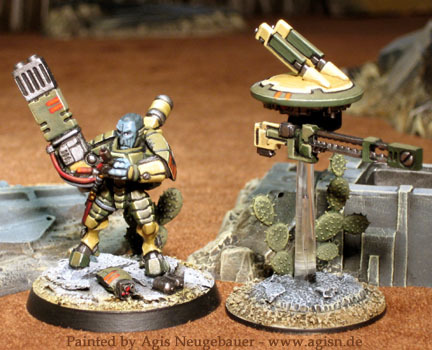 The plasma gun was painted light blue to make it look a bit like the suit from the codex cover. I also put up a picture of an old RAFM Heavy Gear (Northern Guard Kodiak Destroyer HACS-10HG-TH) for size comparison. The older 1/87 HG are fitting from size and style! 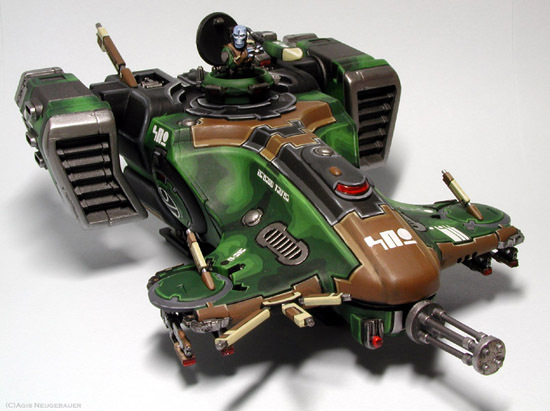 I liked the Devilfish Troop carrier right from the first sketches I saw. So the most logical choice to paint was this kit. The Devilfish kit is also a very nice kit. You get some pieces and bits that can be used as almost all vehicle upgrades. My model is equipped with seeker missiles, a multi-tracker and decoy launchers. Since the model is the carrier for the Pathfinders I chose a camouflaged paint scheme. 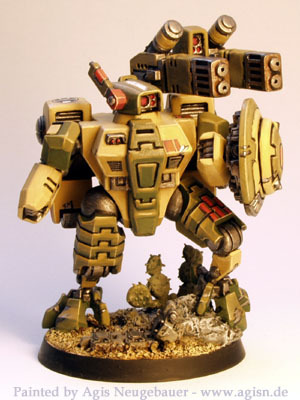 Even before painting the first Tau warrior I started to build the Avenger Titan-suit. As mentioned above I do like Gundam. 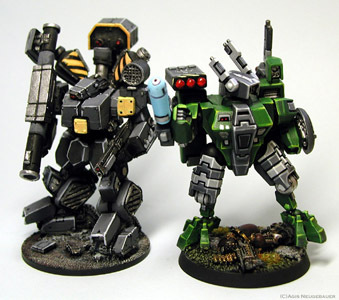 So why not use one of my Gundam models, convert it a bit, paint it in the colours of my Tau army and design some rules using the VDR of GW? The best thing about the Bandai models is that they are fully posable. Nearly every joint can be moved. You can also change the weapons and hands. You can literally play with these models. 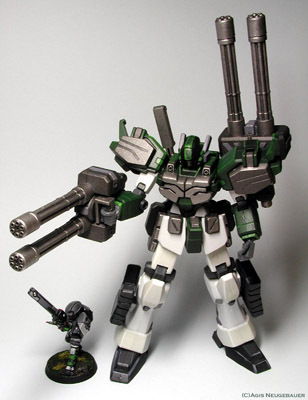 The whole thing started as a Gundam 1/144 Custom arms model from Bandai. I only modified the head to make it look a bit more like the Tau. The hands are of course still wrong because the Tau with their 8 fingers and 8 numerical system would not build an Exo Suit with 10 fingers. 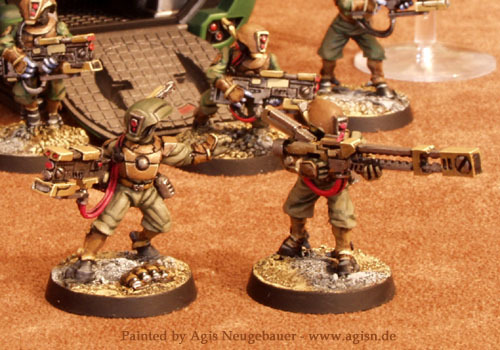 The lower leg / foot part is also not really tau-ish in appearance. 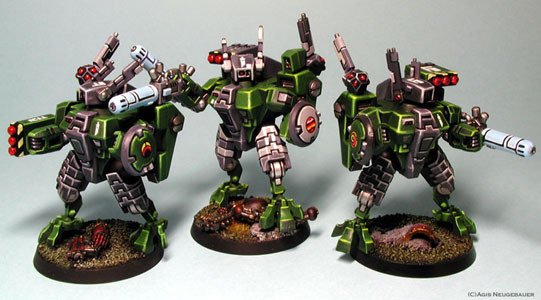 Maybe I do some heavier conversion work with next titan. We’ll see. While playing at a local store I saw the following mini. 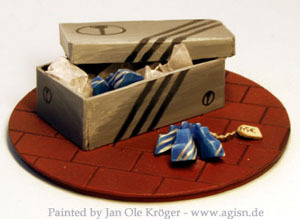 Not something too serious for the wargaming table, but just amazing IMO. Nice detail (the IPod), great idea and cute execution. 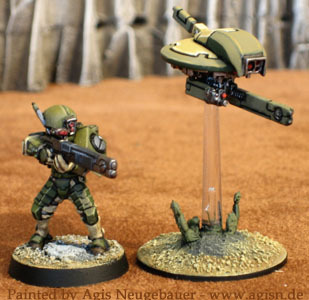 The conversion of the Aircaste Disco Fever Tau is from Jan Ole Kröger. Tau logo courtesy of Edward Fortae.